Special Containment Procedures: SCP-2658 is to be kept in Containment Locker 1410 in Site 73. Within the locker, SCP-2658 will be stored in a standard collectible card sleeve, which will in turn be within a standard collectible card toploader. Staff members who maintain or have in the past maintained collections of Magic: the Gathering cards should not look at or interact with SCP-2658. Description: SCP-2658 is a ruled index card trimmed to dimensions of approximately 2.5 inches by 3.5 inches (63 x 88 mm) with cut corners, roughly the size of a standard poker playing card. 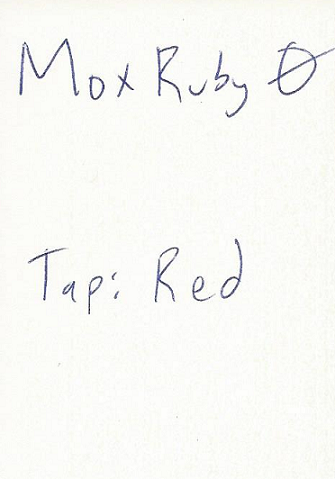 The words “Mox Ruby”, “0”, and "Tap: Red" are written on the reverse side of the object in blue ink. These correspond, in part, to the text on the card Mox Ruby from Magic: the Gathering (hereafter referred to as Magic), a popular trading card game. SCP-2658 otherwise has the physical characteristics expected of such a card. These perceptions are consistent amongst affected individuals, each seeing a given card as the same incorrect card. Images of cards which have themselves been seen by at least one exposed individual are also affected, but not images of cards that have not been seen. For instance, should one affected individual see a genuine Mox Ruby, all images of that copy of Mox Ruby will be seen incorrectly by all affected individuals. Images of any other copy of Mox Ruby will be seen correctly. It is speculated that this effect is present in order to make it more difficult to prove to affected individuals that their cards are not what they see them as. After approximately one week, those affected by SCP-2658 will give away the bulk of their valuable cards which they now perceive as worthless, usually to new or young players at local game stores. These gifts will continue even if others attempt to inform affected individuals about the true nature of the cards involved; these attempts are always dismissed as an attempt at a prank. Following these gifts, subjects will cease collecting, investing in, and playing Magic, stating that it is a "waste of money" and that they "have enough cool cards already." Those who are not collectors of Magic are entirely unaffected. The distinction between a collector of Magic and one who is only a player of Magic is dependent on what an individual believes themselves to be, as those who have a large number of Magic cards but do not consider themselves to be a collector are unaffected. It is unknown why this distinction is made. SEE Addendum 11/05/18. Attached was Image SCP-2658-003. 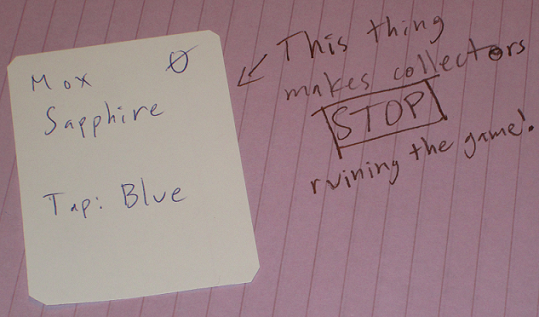 The words on this card correspond to Mox Sapphire, another rare and expensive Magic card. The user's icon on the website was an image of an instance of SCP-248, and the user's forum signature claimed allegiance to Gamers Against Weed. The thread and WondertainmentDDS' account have since been deleted, under cooperation with the ███ █████████ staff. Amnestics were distributed to users confirmed to have seen the thread. Given the description contained in the post and the similarity in handwriting between the images, this individual is almost certainly the creator of SCP-2658, and the pictured object likely has similar if not identical properties. Attempts to trace the location of this user resolved to the IP address 4.2.0.69. The owners of the computer using this address were interviewed and determined not to be WondertainmentDDS, as they had never heard of Magic: the Gathering and appeared to possess neither anomalous objects nor the ability to create such. This spoofed IP address was likely an attempt at humor. Efforts to locate this individual, as well as any other anomalous objects they may have created, are ongoing. 1. Images of SCP-2658 do not trigger its anomalous effect. 2. "Market value" seems to be a combination of various online retailers' prices for the card. Should a card change in value to outside of the given price ranges, those affected by SCP-2658 will no longer perceive it differently from reality. It is not known how this information is obtained, as reversions of card identity following price changes are noted even in subjects with no non-anomalous access to information from the outside world. 3. Other collections given away include comic books, coins, Japanese swords, and vintage wines.